This week was better than last. We had a couple close, down-to-the-wire plays. We, like any week, are starting to eliminating teams after bum performances. The AFC Wild Card picture is still a clutter, with five teams fighting for two spots. The AFC though, has three teams that have clinched division championships. Those help, big time. After a five play, 57 yard drive by the Dolphins, Miami lined up to kick a field goal, only to have it blocked and returned 62 yards for a TD by Kyle Arrington. It gave New England a early 7-0 lead. Oh yea! Guess who returned for this game, and actually did something? 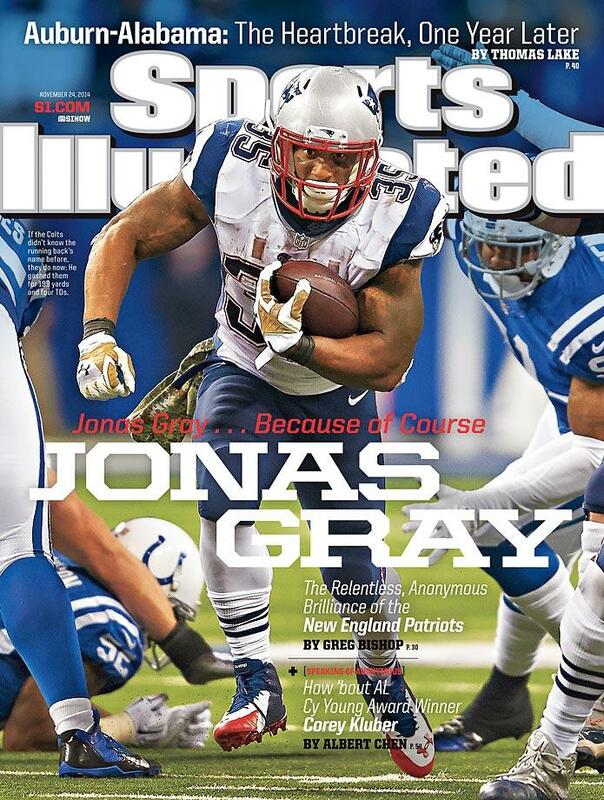 Jonas Gray sighting! He ran for 62 yards on Miami Sunday. He didn’t score, but did play an effective role. Towards the end of the first quarter, Miami got something going, but couldn’t put it the end zone, leading to a field goal that wasn’t blocked this time. Tom Brady is Tom Brady. He’s going to do Tom Brady things, and Sunday, he did just that. Completing 21/35 passes and throwing for 287 yards, he lead the Pats throughout the day. Who said he or the Pats weren’t good anymore? Oh. He’s said other things that have looked really bad before. But I have too! Anyways, New England took a 14-3 lead with 7:59 left in the 2nd on a Shane Vereen TD run. Shortly after, Miami kicked another field goal, cutting the lead to 14-6. I keep reiterating this: This was Ryan Tannehill’s make or break year. He’s made it. He has proved to the Dolphins to keep him around. Even though Sunday’s result wasn’t pretty, and there is some ugly rumors with their coach, Tannehill is really good. He’s starting to show it. Sunday, he completed 29/47 passes, threw for 346 yards, with a TD and two picks. It wasn’t great, but it’s one game, also against a better team. Right before halftime, Tannehill threw that TD pass to Mike Wallace, making it 14-13 at halftime. Miami never scored again, not once. That’s your second half. Five Patriots scores. Three TD’s and two field goals. It was an absolute offensive explosion from New England. So much for boring third quarters. This really didn’t have much to do with Miami. Yes, the defense needs work, but it’s the Patriots. They can do this to anyone. It doesn’t matter what defense their playing. Rob Gronkowski is absolutely insane. He just may be the non-QB MVP. His presence changes an offense. Miami just couldn’t defend this assault. They were helpless. The Dolphins have a good offense, but not one that’s capable of exploding for points. It’s not built like that. Really, neither is the Pats’, but look at who’s behind center and on the sidelines. Wait, so how did Buffalo win this game? Or is it how did Green Bay lose this game? I don’t know. This game was weird. This game should have been tie! Yea! Alright, both teams played awfully. Neither QB had a good game. No wide-reciever blew any one out of the house. This was one weird game, and it had to be disappointing if you were a fan of one of these teams. Mason Crosby scored the first points with 4:27 left in the 1st quarter, putting Green Bay up 3-0. Field goals dominated this game, surprisingly. Soon after, the Packers got the ball back and ended up punting. The punt was returned by Marcus Thigpen, who took it 75 yards to the end zone, putting the Bills up 7-3. Neither QB had a good game. Hilariously, both of them, Aaron Rodgers and Kyle Orton, had the same QBR, OF 17.2! 17.2! THAT’S TERRIBLE! AARON RODGERS HAD A QBR OF 17.2! That’s the worst of his career, and this game probably was statically and performance wise. Rodgers completed only 17/42 passes, throwing for 185 yards with two picks. No passing TD’s. Yikes. Kyle Orton though, didn’t do any better. Orton completed 14/27 passes, throwing for 158 yards with one pick. No TD’s. Neither QB threw a TD pass! How crazy is that! To start the second quarter, Eddie Lacy ran in a TD, giving the Packers a 10-7 lead. Lacy had 97 yards with that TD. It doesn’t matter how bad his team is playing, Lacy is going to contribute and preform. He’s a beast. After those FOUR field goals, the Bills lead 19-10 with 9:23 left. Green Bay tired to get back in it with a field goal of their own with 4:51 left, but their next possession resulted in a safety, ending the game. So what really happened here? Well, the Packers didn’t play good football as a team. Green Bay is built so that if one thing goes wrong, they can cover it with something else. Nothing was cranking. Rodgers’ bad game didn’t help, and poor offense line play didn’t allow the Packers running game to ground n’ pound as usual. The stats might have said different, but it just wasn’t Green Bay’s day. Buffalo, like St.Louis, is a spoiler team. They will ruin your weekend, as they did to many Packers fans Sunday. Both of these teams are playing for division championships. Neither team though, is great. Atlanta plays in the stinkiest division in football; the catastrophe that is the NFC South. The Falcons aren’t a good football team. I mean, there 5-9, and could easily win their division. The Steelers though, at 9-5, and have clinched a winning season. They play in a division where three teams could make the playoffs. They are still in the race for the division crown, but better teams surround them. This game gave them a boost. Two Shaun Suisham field goals in the 1st quarter put Pittsburgh up early. Both of those drives took five minutes each, something that the Steelers have done well with this year. To open the second quarter, William Gay picked off Matt Ryan, and took it 52 yards into the end zone. It was thankfully Ryan’s only interception on the day, but it did sure cost them. Matt Ryan finished with a 68.5 QBR. Ten minutes later, Devin Hester caught a TD pass from Ryan, cutting the lead to 13-7. Hester has made an impact on the Falcons this year. He had five catches and 85 yards on the day, with that TD catch. It was one of two Matt Ryan would throw. Right before halftime, Le’Veon Bell ran in a TD on the one yard line, giving Pittsburgh a 20-7 halftime lead. Bell finished with only 47 yards, but had 2 TD’s. He’s been phenomenal this year. With 1,278 yards and 7 TD’s, Bell has been one of the best running backs in the league. Really, he’s one of the NFL’s most exciting players. The lead but held for the Steelers, even though it took Atlanta a while to get their stuff going in the second half. Matt Bryant kicked two 3rd quarter field goals, making it 20-13 heading into the 4th. The halftime lead was a little to much for Atlanta though. Le’Veon Bell ran in his second TD at the start of the quarter, putting Pittsburgh up 27-13. Ben Rothlisberger threw for 360 yards and completed 27/35 passes. Though he didn’t throw a TD, his completion percentage was outstanding. He’s had a great year. It’s to bad his team isn’t just a tad better. This was a really boring game. I mean, who would’ve thought? These were supposed to great teams this year. This is a game we’d get hyped for each week. This was the NFC Championship Game last year! Now look at it! It was a combination of both. San Francisco’s defense did well, but their offense is literally stagnant. It does absolutely nothing. Early in the 2nd, Frank Gore ran in a ten yard TD, putting the 49ers up 7-3. Gore only had 29 yards due to a concussion suffered later in the quarter. There was one score per quarter in this game. I’m not even sure it was a defensive game. Marshawn Lynch ran for 91 yards and a TD. Seattle ran for 152 yards as a team. The Frank Gore TD was the 49ers only score of the game. Lynch ran in his TD in the 3rd quarter, putting Seattle up 10-7. Early in the 4th, Russell Wilson threw a TD to Paul Richardson, putting Seattle up 17-7, and that ended up being the final score. Colin Kaepernick had another pretty bad game. Completing 11/19 passes and throwing for 141 yards, his QBR came in around 16. Not good, at all. I’ve already expressed my thoughts on the 49ers. Look, they aren’t a good team right now. I’m not sure exactly what it is, but something needs to change, wherever and whatever that may be. (cont.) heading in the opposite direction as Seattle, the Seahawks are soaring. They are finally playing defending champion football. I really wouldn’t be surprised if we’re talking about them in late January. This was no where near as close as the score shows. The Broncos dominated this game on all fronts. They forced two key turnovers, which didn’t help an already poor playing San Diego team on Sunday. The Broncos got out to an 9-0 lead, odd for such a powerful offense. Even without a touchdown by Denver, you could tell that it wasn’t San Diego’s day. In fact, there were no TD’s in the first half as Denver lead 9-3 at halftime. Right before the break, Peyton Manning left the game. He had been battling the flu all week, and first reports suggested he was getting an IV. Later to find out, he suffered a thigh injury on a nice block near the end zone. Manning left early, but returned for the 2nd half. Through all of that, Manning still had a QBR of 93.2, with 233 yards and a TD. Denver ran the ball nicely with C.J. Andersen, as he rushed for 85 yards. Late in the third, Manning threw his TD pass to Demaryius Thomas, on a 28 yard throw. It put the Broncos up 16-3, a lead that Denver extended and one that San Diego never came close to. With a QBR of 30.9, Philip Rivers had a rough game. Throwing 232 yards, he had two picks and one touchdown. His accuracy was terrible, completing 24/41 of his passes. San Diego didn’t run the ball, which hurt them offensively. The Chargers don’t have big-time receivers, so leaning on the minimal running game they have is essential. I don’t think this Charger squad is a playoff team. Their defense is terrible, especially the secondary. They may have a better offense than Kansas City, but the Chiefs play outstanding in the front seven. I’m not being a homer and saying the Chiefs will make the playoffs, because there is a pretty good division up North that will sneak a team in, at least. I’m saying that Kansas City has better defense than San Diego does, and that may help one team or the other get in. Wait, how was this game so close? Oh yea, the Cowboys can’t start fast because they’ll just blow the lead! Dallas opened up and lead 21-0 with 11 minutes left in the 2nd quarter. Tony Romo had thrown two TD’s, both to Dez Bryant. Bryant had an incredible night, with six catches, 114 yards and 3 TD’s. That’s as many TD’s that Tony Romo threw Sunday night. But, it’s the Cowboys, folks. They blow leads. And that’s exactly what they did! Three running TD’s by Chris Polk and LeSean McCoy put the Eagles up 24-21, also thanks to a field goal. 24 unanswered points given up by Dallas. Sounds like a Cowboys thing to do. Toward the end of the 3rd, DeMarco Murray ran in a TD, putting Dallas up 28-24. The Cowboys soon after scored again, icing the game. Murray had 81 yards and 2 TD’s in the win, but suffered a broken hand in the contest. Murray had surgery yesterday, and will game-time decision on Sunday, which is surprising. Overall, Dallas needed this game after getting embarrassed on Thanksgiving. This will be a critical game in determining this division. Whoever loses the division, will probably get a Wild Card. I say that, imagining that the NFC North or West only gets one team.